Charlotte Dod, known as Lottie was born in 1871 and lived until 1960. Amazingly she won the Ladies Singles Championship five times at Wimbledon and was the youngest woman ever to win the trophy. However it was not just in tennis that Lottie excelled. In fact she was the sports polymath of her day; she was also a golf champion and an olympic silver medallist in archery. She has made it into the Guinness Book of Records as the most versatile sportswoman ever. She was born in Merseyside to a rich cotton merchant and she and her siblings did not have to work, so she was able to devote herself to sport. The other three children were also accomplished sports men and women and indeed her brother Willy won an olympic gold for archery in 1908. Lottie began playing tennis when she was nine at courts which had been built close to her home. Lawn tennis was becoming increasingly popular especially among the leisured classes and were often the basis for parties where the Dod family came to know the Wimbledon champions of their day. Lottie entered tennis competitions from being eleven and played with her sister in doubles matches. By 1887 when she was only 15 she had established herself as a force to be reckoned with at the highest level and in fact one the Wimbledon title for the first time before her 16th birthday. She won the title in three consecutive years from 1891. 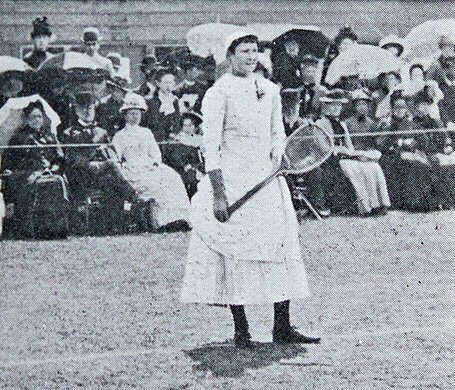 Although she continued to enjoy tennis she then took her attention elsewhere for a time during the 1890s. She enjoyed winter sports including figure skating, curling and mountaineering. She then took up field hockey in 1897 and within a short time was playing for her country but by 1901 she had lost interest, caused it had been suggested by her mother’s death in 1901. Thereafter she became a champion golfer. She had been interested in golf since 1894 and by 1905 had won championships but again moved on, this time to archery. She and her brother had become interested and she went onto win a silver in the 1908 games while Willy took a gold. The club she was a member of, closed in 1911 and Lottie never played competitively in any sport again. She had been troubled by sciatica for some time which stopped her being able to go abroad to nurse during the 1st world war. She did nurse however in a military hospital. She continued to have a great love of tennis and attended Wimbledon until she was in her late 80s. She died in her bed listening to Wimbledon radio broadcasts and was elected to the International Tennis Hall of Fame in 1983.